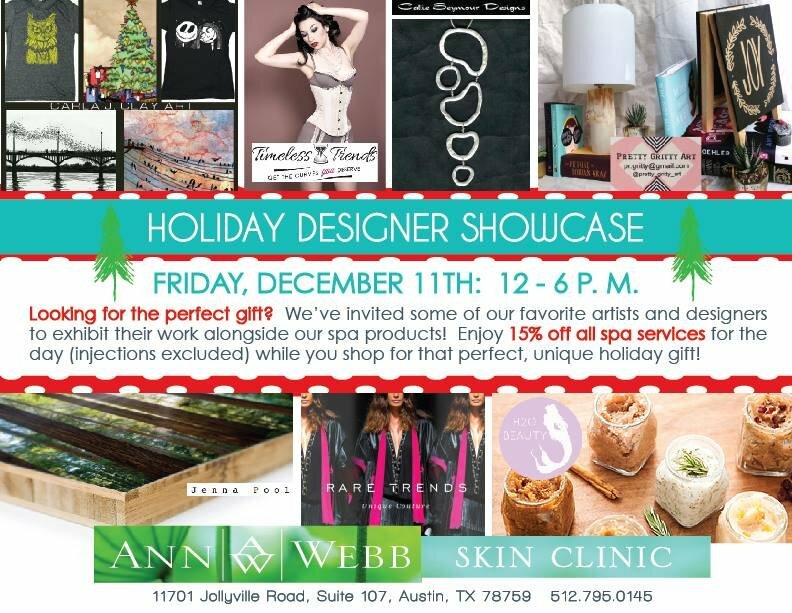 Join us for our Holiday Designer Showcase where you can shop from our favorite local artists and designers and receive 15% off any spa service (injections excluded)! Meet our artists/designers for this year’s Holiday Showcase! JENNA POOL — Nature and landscape photography mounted on bamboo and aluminum. CALLIE SEYMOUR DESIGNS — Modern, handmade silver jewelry featuring organic and geometric designs. H2O BEAUTY — All natural, handcrafted soaps, bath bombs, shower jelly, hair, and lip products. CARLA J. CLAY ART — Fun and festive art prints, cards, and t-shirts. TIMELESS TRENDS — Premium quality corsets with steel boning for an amazing hourglass figure, featuring a lifetime guarantee. PRETTY GRITTY ART — Chalkboard signs and unique home goods made out of recycled and found materials. As you know, Austin has had the wettest spring on record, so The Great Outdoors is overstocked! They need to sell merchandise to make room for new products. So it’s time for a HUGE TENT SALE…bring your truck or van because you’ll want to load up for this one. Plants, fountains, pottery, giftables and much much more. 50% OFF on Friday, 60% OFF on Saturday and a whopping 70% OFF on Sunday. Come early for the best selection!!! The Great Outdoors is located @ 2730 South Congress Ave.
You’re invited to join us for the ROAR Grand Opening. Join us for this special night at ROAR on Rainey Street! Young & Fabulous is the source for trendsetting women’s fashion providing exclusive designs in women’s apparel and accessories offered from around the world. Young & Fabulous unveiled the new 2013 L.A.M.B Spring Collection by Gwen Stefani. ART + FASHION: art by Nina, Dell Children’s Hospital was the beneficiary of funds raised during this event. Models from San Antonio and Austin adding a special touch. Read more online on Influential Magazine. Just a few events you don’t want to miss. Nov 10th: ZINK Grand Opening, Nov 15th: RITUAL Salon Grand Opening and Nov 28th: Cedar Springs Austin presents The Art of Giving Back benefiting People’s Community Clinic. RSVP.